Krampus #1 introduces readers to the Secret Society of Santas, a group of legendary holiday figures from around the world who have been bestowed magical powers by the first Santa—St. Nicholas. When the bones of St. Nicholas are stolen, the Society’s magic mysteriously vanishes, leaving the group stranded at the North Pole. Seeing no other solution to their dilemma, the Society releases Krampus from his North Pole prison and enlists his help in recovering the remains of St. Nicholas in exchange for his freedom. To ensure his compliance, Krampus is outfitted with a high-tech “naughty bomb” (courtesy of Japan’s Santa, Hoteiosho) that can detect when the wearer misbehaves and will then arm and detonate. I suppose nothing beats the fear of exploding when it comes to keeping a mischief-loving mythical beast in line. Joines clearly did his homework on the history of Santa myths and legends before crafting the famous cast of characters in Krampus #1. Placing those characters in a plot fitting of a Dan Brown novel was a bold move, but one that adds the unexpected twist to this Christmas comic that really makes it work. Joining forces with the team of visual arts magicians that includes illustrator Dean Kotz proves that Brian Joines most certainly made it on the “Nice List” this year because the graphics set a wonderful tone for the story’s dark theme and wise-cracking dialog without being cartoonish or goofy. 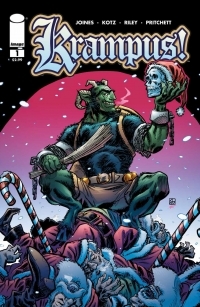 The cliffhanger ending has me eager to lay hands on the next issue in this series, but until then I recommend that you stuff as many stockings as you can with Krampus #1.